Dr. Suzanne Humphries has given what is the most comprehensive and informative lecture on vitamin C that I have ever heard. The entire lecture can be watched below. Please be informed about vitamin C, and how powerful this natural vitamin can be in treating disease. If everyone learned about the health properties of vitamin C and used it accordingly, it would put a serious dent into the sales of patented pharmaceutical products. The Swedish Society for Orthomolecular Medicine introduced Dr. Suzanne Humphries to lecture on the practical use of Vitamin C in Stockholm, Sweden 2014. Dr. Humphries states that since she has learned to use Vitamin C, not only has her own health become extraordinarily better, but her prescription writing has gone down significantly and the health of her patients has improved. Dr. Humphries states that there is a lot of mythology in the medical field regarding vitamin C. The fact that vitamin C is necessary to prevent scurvy, but that doses over 1000 mg are dangerous, wasteful and just gives you “expensive urine,” is a myth. Scurvy is a disease that occurs if you have a severe lack of vitamin C (ascorbic acid) in your diet, causing anemia, gum disease and skin hemorrhages. Conventional doctors may say that the body becomes saturated if consumers take more than 150 mg a day. In addition, that in large doses vitamin C can cause kidney stones. We hear that natural whole vitamin C is always the best source, food is always the best source, and the statement that people with illnesses can get enough ascorbate (vitamin C) from food. 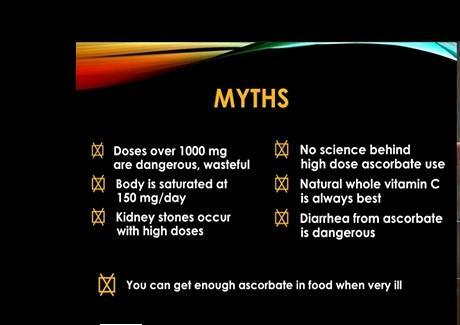 None of these myths we hear are true or have ever been proven clinically or scientifically according to Dr. Humphries and medical literature. The fourth enzyme is missing from human beings as well as some other animals (bats, guinea pigs and some primates). This means that human beings are dependent on the food source in order to have this life saving nutrient. There are animals that make their own vitamin C, for example, a cow makes 18 mg/kg/day, daily total of 12,000 mg a day plus food. 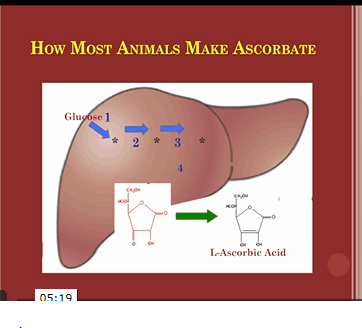 Another animal she discusses is cats, who make 20 to 40 mg/kg/day, daily total of 180 mg a day. The Recommended Daily Allowance (RDA) for a person is half of that amount. The animals that rely on their food source, such as a gorilla, the intake is 30 mg/kg/day for 4,500 mg per day. The guinea pig also does not make their own vitamin C, and intake is 33 mg/kg/day for 30 mg per day. Dr. Humphries has learned some interesting facts about goats. 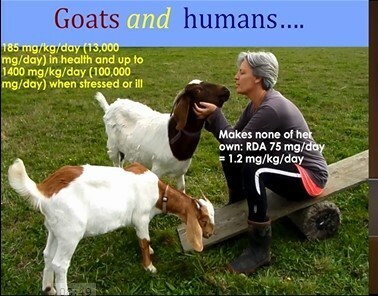 When goats are healthy, they produce 185 mg/kg/day (13,000 mg/day) and when sick or stressed, up to 1400 mg/kg/day (100,000 mg/day). A veterinarian was on the farm in New Zealand where Dr. Humphries is seen in this picture, and he volunteered that goats hardly ever get sick. The RDA for men is 90 mg/day and for women is 75 mg/day. When scientists attempted to change the RDA of vitamin C to 200 a day, it was rejected by the authorities according to Dr. Humphries. When a person develops an illness, the vitamin C reserves can be depleted very quickly. Dr. Humphries stresses that the RDA levels for vitamin C are to prevent scurvy, not promote optimal health. The graph on the picture above shows hospitalized patients as the black bars and outpatients are represented by the clear bars. Dr. Humphries points out that both groups have people that are 100 or 125, she believes that this is a better range for us to live in, either with a high diet of this nutrient or repeated doses. She states that 24 percent of the people that were admitted into the hospital were taking vitamins and the doctors discontinued most of them. 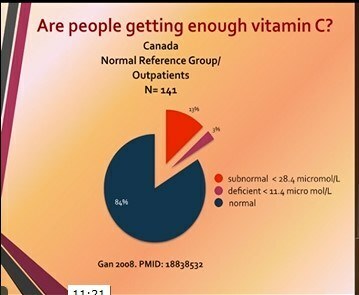 Dr. Humphries states that we are living with this myth that we do not need to look at vitamin C levels in sick people and we don’t need to supplement. 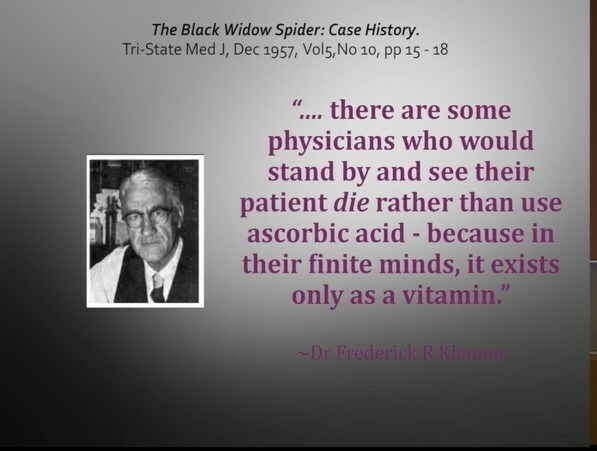 Dr. Frederick R. Klenner was one of the pioneers of using ascorbic acid in high doses and cured many patients with horrible diseases in the 1950’s, including polio and a black widow spider bite (documented in The Black Widow Spider: Case History. Tri-State Med J, Dec 1957, Vol5, No 10, pp 15-18). Dr. Humphries discusses a study from New Zealand with healthy adult males around 30 years old. These males offered to do a muscle biopsy to measure the vitamin C levels. Initially, they measured the men’s blood levels which were on the low end, around 30 to 40 Mol/L. They were then told to consume a diet low in vitamin C and stop supplements, and the levels dropped considerably in five weeks almost to levels of scurvy. Next, half of the men were told to eat half a kiwi a day and the other half two kiwi’s a day. 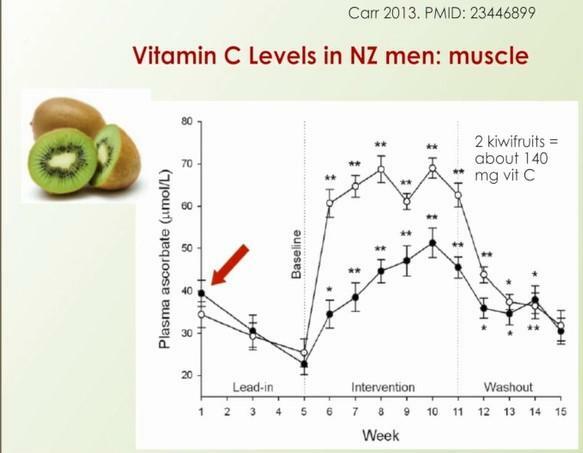 The levels of both groups were raised considerably, but the men who ate two kiwi’s a day, had levels that rose up to 70 Mol/L. The need for vitamin C can be divided into categories; anti-oxidant, anti-histamine and enzyme co-factor. Vitamin C acts as an electron donor and fixes the damage that is done by the oxidants in our environment, such as, car fumes, environmental sprays or from any poison. Vitamin C also acts as an anti-histamine, and protects people from pollen and allergies. Dr. Humphries discusses two medical issues that many doctors deal with daily, diabetes and high blood pressure. Both of these medical problems are associated with low vitamin C. Dr. Humphries states that both of these problems respond to vitamin C supplementation. Dr. Humphries states that blood vessel health, cholesterol metabolism and blood pressure are all improved by taking vitamin C supplements. In the 1950’s there were biopsy’s done on people with heart attacks and strokes, and parts of the brain and heart were found to be extremely low in vitamin C, according to Dr. Humphries. We make many other antioxidants in the body, but this one has more power. Ascorbic acid is very bitter and it is what we find in the natural food. The body likes to bring in sodium ascorbate, our intestines need sodium to bring the ascorbate into the body. We can either take it as ascorbate acid and we will use the sodium from something we have eaten or we can take sodium ascorbate. Dr. Humphries recommends supplementing with sodium ascorbate. 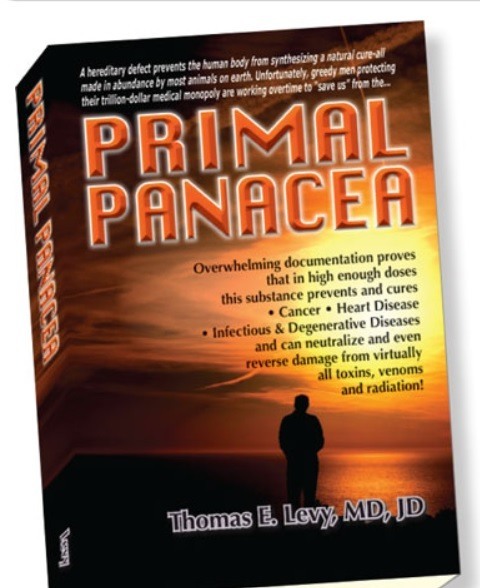 Dr. Humphries recommends reading Primal Pancea (MedFox Publishing ), By Thomas E. Levy, MD, JD. Dr. Humphries explains that our bodies are made of energy that has electrons, protons and neutrons. Oxidative stress causes a chain reaction in the body. Vitamin C can stop this chain reaction and improve the damage that has already been done. Dr. Humphries continues that the over production of free radicals (something missing an electron) can cause damage to the nerves, the proteins, the DNA, the mitochondria and lipids. This can lead to diseases, such as: atherosclerosis, cancer, diabetes, rheumatoid arthritis, heart disease, chronic inflammation, strokes and septic shock. Dehydroascorbic acid (DHA) is an organic compound that occurs when ascorbic acid is oxidized. If there is too much DHA, the used type of vitamin C, we either get rid of it in the urine or recycle it in the body. The concentration of vitamin C is extremely important for pregnant women and babies. Dr. Humphries talks about the high rate of jaundice in new born babies (approximately 60 to 70 percent). Dr. Humphries shared a study where pregnant women in their first trimester were given one gram of vitamin C orally every other day for six months, the percentage of neonatal jaundice was greatly reduced. There is another myth that Dr. Humphries discusses regarding calcium and the large amounts of calcium that people need. She states that we need vitamin C in addition to calcium for bones. Vitamin D and vitamin K2 are needed for mineralization. Vitamin K2 tells calcium where to go in the bones. Micronutrients like B vitamins are important as well as trace minerals. A good well rounded diet is always important. Dr. Humphries provided a short list of conditions that there is medical literature to support where vitamin C is beneficial. Vitamin C is antiseptic and antibacterial, it can be put on the outside of your body as well as the inside. It has also been shown to be helpful in conditions in intensive care units with severe infections and sepsis. Dr. Humphries starts these whooping cough patients with high doses of vitamin C, all age groups. Whooping cough is a toxin producing bacteria and any illness that makes a toxin needs to be neutralized. The toxin creates oxidative stress, which is an electron thief, and vitamin C gives it back. All vaccines cause inflammation, the arm becomes sore and fevers occur following vaccinations. Vaccines contain aluminium which is a highly toxic metal, when injected into a muscle produces oxidative stress. Vitamin C combats the inflammation and toxins caused by vaccines. Dr. Humphries discusses a study where patients with severe infections and organ failure were given IV sodium ascorbate. The purpose of the study was to determine if it was safe to give these patients high or low dose sodium ascorbate. 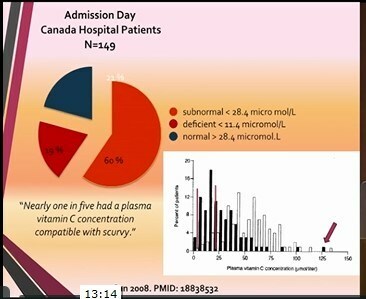 In the study, they gave a third of the patients no vitamin C, a third of the patients 50 mg/kg/24 hrs intravenous and a third amounts of 200 mg/kg/day intravenous. She states that the third amount of 200 mg/kg/24 hrs is approximately 14 grams in a day, which she does not consider high amounts, she would start these patients with at least 100 grams per day. The study used a SOFA score (Sequential Organ Failure Assessment). According to Dr. Humphries this is a highly accurate indicator of death during a critical illness. If you have a high SOFA score in the first 48 hours of critical care then your mortality rate is at least 50 percent, so you would want this score to go down quickly. She believes that this should be enough for a doctor in a hospital to give patients IV ascorbate acid when it is required. Dr. Humphries says there is documentation that shows vitamin C has had powerful effects on other diseases, such as: polio, acute hepatitis, viral encephalitis, acute rheumatic fever, toxic mushroom poisoning, Ebola, hemorrhagic diseases, tuberculosis, and infectious mononucleosis. Dr. Humphries recommends two main types of synthetic vitamin C for every household; Sodium Ascorbate Powder and Lypo-Spheric Vitamin C.
Dr. Humphries explains that one cannot get enough vitamin C from whole foods for therapeutic purposes, and that to see therapeutic results one must supplement with the synthetic form as sodium ascorbate powder or lyp-spheric. Intravenous vitamin C allows much higher doses, but it is quickly depleted from the body. Supplementing orally throughout the day can achieve similar results. Synthetic forms of vitamin C that Dr. Humphries mentions include intravenous which can be helpful for patients with Lyme disease, cancers and serious heart disease. Intravenous is valuable because some cells need to be shocked with high levels of vitamin C, for example, cancer cells. Cancer cells and sick cells are killed by high levels of vitamin C.
Dr. Humphries states that sodium ascorbate powder is affordable and helpful. She recommends that each person needs to assess what their bowels can tolerate. Drink plenty of water prior to this process so you have a good urine flow. An adult needs to start by taking 1 or 2 grams every two hours. When you first have rumbling in your belly and write down what the total was to that point. If you want to supplement on a daily basis, take approximately 50 to 90 percent of that amount every day. The amount will vary depending on the stress levels you are experiencing, physical and mental.